Police have arrested a Long Island couple for tampering with Jell-O pudding mixes at local supermarkets. The arrests followed reports that customers purchased the Jell-O mixes only to discover upon opening them that contained they contained what one police official described as "a fine substance, like aquarium sand." 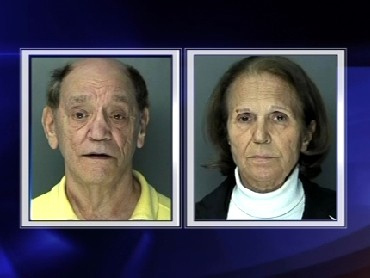 CBS Station WCBS reports that Alexander Clement, 68, and his wife, Christine Clement, 64, have been charged with five counts of petty larceny and five counts of tampering with a consumer product in the second degree. Christine Clement allegedly purchased the products, removed the pudding mixes, and refilled the boxes with sandwich bags containing salt and sand. Police tell WCBS the couple then returned the packages to the supermarkets for a refund. A 3.9 oz. box of Jell-O instant pudding costs approximately $1.20. Authorities said there is no indication that the Clements sought to harm any other consumers, but instead were trying to obtain the product without paying for it. The Clements are set to be arraigned in Central Islip, though a date has not yet been set. "There's no indication that it's a terrorist act against a business or the community," said Suffolk County Police Lt. Michael Murphy. "It was more of a theft, a larceny of sorts." The returned packages were not immediately recognized as having been tampered with, police said, and were placed back on the shelves for resale. Three of the markets are in Brookhaven, Smithtown and Huntington in Suffolk County, and a fourth in the Nassau County town of Woodbury. The Stop & Shop stores notified police on Wednesday and Thursday.